As a design studio we obviously are proud of our projects and feeling relieved when they are finally completed and look just as good as we imagined them. We do however value the work and the design process that goes behind the scenes, which makes our job even more rewarding. Today we have our Senior Designer Julia, speaking about our recently completed project in St John’s Wood. In particular this week we are discussing a favourite space of the house- the Kitchen! A space for family reunions, friend gatherings and … creativity. As interior designers working on a residential project, first and foremost we have to please the client and bring upfront their personality. Julia tell us more about the client of this particular project. The client for this project is a lovely couple from Russia, who after living in Germany for a while wanted to settle in the UK with their son. They already had exchanged on the property and had the planning permission and the listed building consent when they approached us to refurbish and redecorate this beautiful late Regency early Victorian style property. The wife, having an education in art history and organising artist’s exhibitions in London, has a strong sense of beauty but no confidence in interiors, so she was very open to our ideas and encouraged us all through the design process. You mentioned that the property is a late Regency early Victorian style house. Tell us more about the features of the house and what was the actual brief you worked on? The house was indeed build in Victorian times, 1840, to be precise. Our client was intent on keeping the spirit of the house alive. 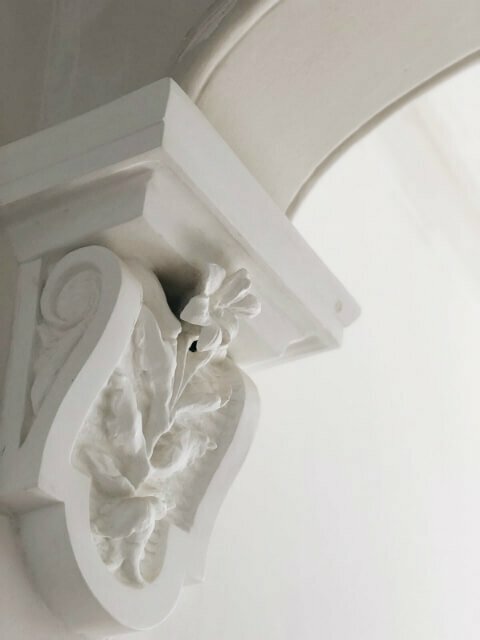 It’s a beautiful property with lots of romantic architectural details, floral corbels and original fireplaces, however it was refurbished very inconsiderately in the past without much attention to detail. She wanted a practical family home, that functions well and where they can spend time together and have relatives over who might be visiting for several weeks at a time. So cosiness and comfort were key and so was beauty. She didn’t want compromises or things that don’t keep in style with the interior. One strong restriction that was imposed on us, was – as expected – the budget. This was non-negotiable and for the style and quality they were expecting we really needed to dig deep and go to unusual sources to find pieces and shop around for the best prices. Going to the star of the show, let’s talk about the kitchen! What inspired you, what did you want to achieve with this space? We have designed a traditional style kitchen that brings joy and aspires to be a subtle backdrop for family life, a comfortable place that is used every day, not just for cooking, but for conversation, entertainment or simply just sitting with a cup of coffee and gazing out through the window. We wanted the kitchen to feel like part of the house, and not something utilitarian. The soft green colour of the cabinets has a great effect on the whole space and creates a feel of casual playfulness. We chose patterned roman blind for the same reason and even added a cute table lamp to make the space feel more like a living space. How would you describe the design process? 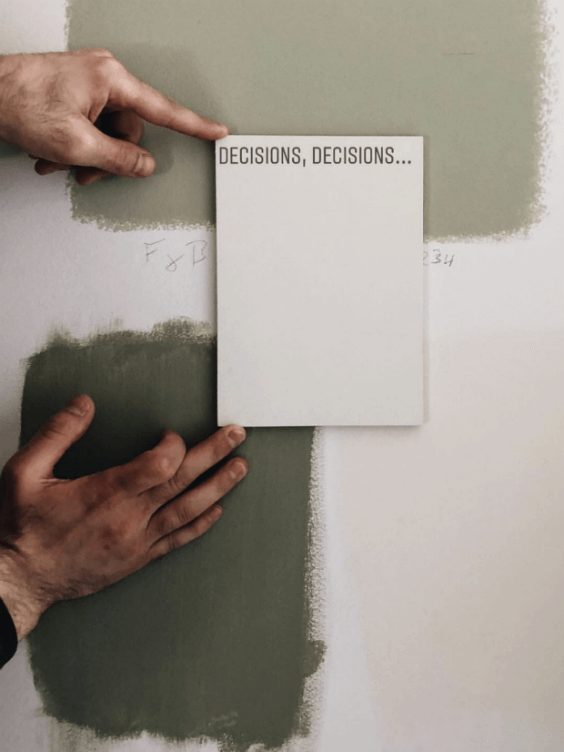 What decisions did you make in order to meet the client’s brief? 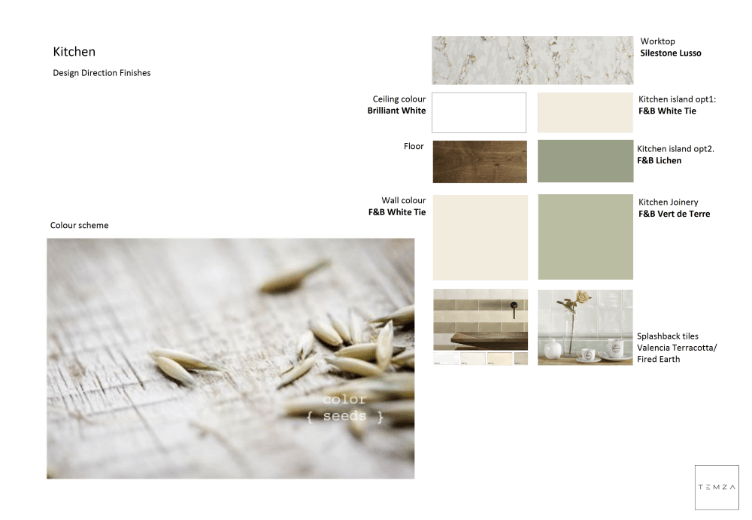 During the design process we have consulted every member of the family, even the client’s 11 year old son to ask him which colour kitchen fronts would most likely inspire him to help his mum with cooking. 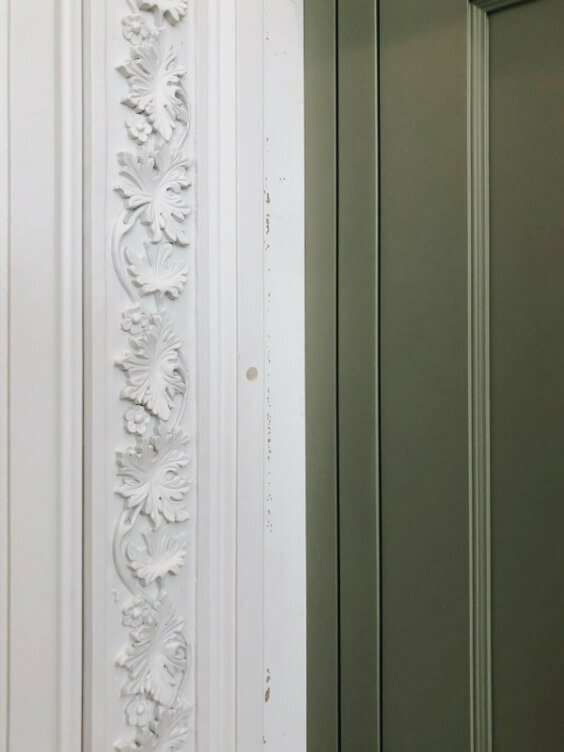 We have chosen a spring-themed colour scheme for the house with soft ivories, warm greens and light blues, incorporating many nature inspired motifs, especially on the lower ground floor which looks out onto a lovely, romantically landscaped garden. 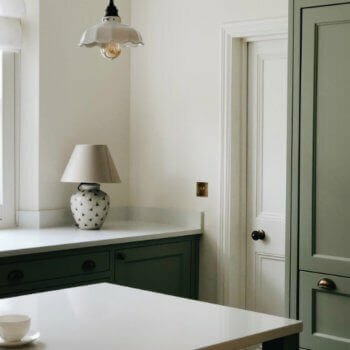 The kitchen fits into this theme with its fully bespoke cabinetry painted in Farrow and Ball’s Vert de Terre, with a large kitchen island of their slightly darker shade green, Lichen. The integral setup of the kitchen was a month long discussion between the client and our design team, during which everything was considered and space was designated for each item from the biggest pans to the tiniest tea towels. 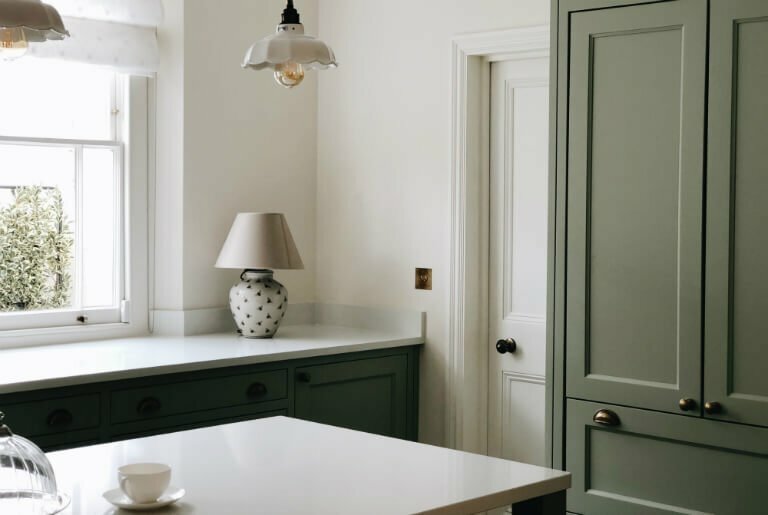 We believe that the elegance of the kitchen shouldn’t be only skin deep and spent the time and effort in making sure that it will still look the part when it’s in use with oak effect carcass, and matching inserts and drawers. The traditional style butler sink and lovely aged brass kitchen tap all add to the homely atmosphere. Obviously the process doesn’t always go smoothly. What challenges did you face and how did you deal with them? Talking about problem solving, the two biggest challenges were, as it is in every project the timeline and the space itself. The project was rather fast paced, we completed all the works in 5 months, and that included rip-out, new underfloor heating system, adding insulation, fitting out the loft and all sorts of lengthy building works that we needed to undertake before the pretty part started. 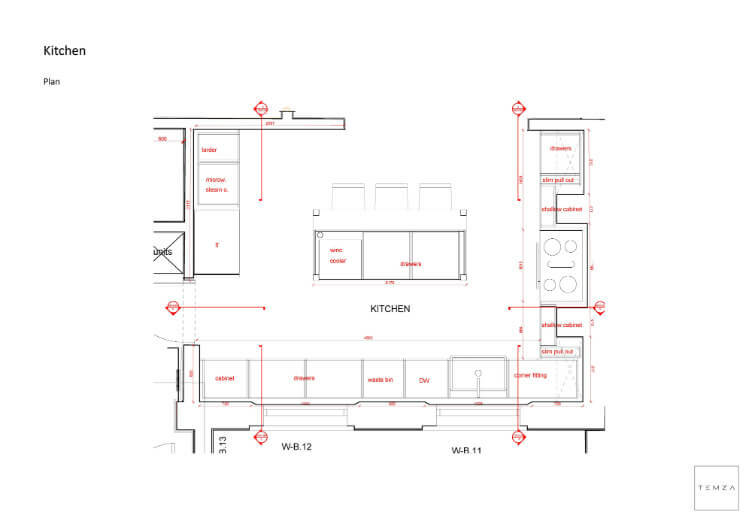 We needed to prioritise the kitchen design from the beginning and design everything even before we could take final measurements and adjust it later to allow enough time for the joiners to manufacture it from scratch. Our design and construction team was working parallelly and communicating all through the project to make sure we could hand over on time. With a tight deadline and a risky approach to designing and building the space. What other unique ideas and initiatives did you take? Aiming to utilise every bit of space is a common denominator of kitchens. The previous layout was with a big free range cooker placed between two structural columns that the client wanted to upgrade to a practical modern oven. We needed to work with these columns and design the kitchen in a way that that makes them blend in. Our design team turned this challenge into an opportunity and created two beautiful glazed units on either side of the oven with recessed niches underneath that provide additional worktop space and also the perfect spot to tuck away any appliances that are used every day. Even the narrow spaces in front of the columns are utilised by shallow shelves holding spaces and oils so they are easily accessed while cooking. Speaking of design and decoration, tell us more about the products and materials of choice. 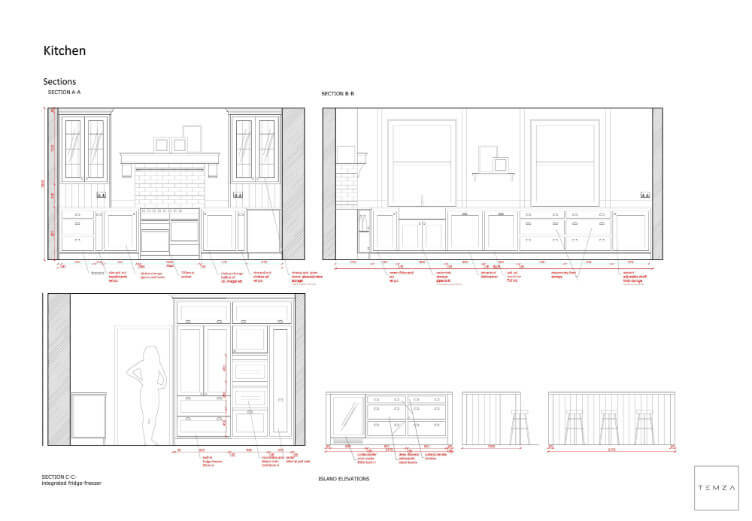 We worked closely with Bfurnished Joinery who manufactured the cabinetry for the whole house based on our drawings. 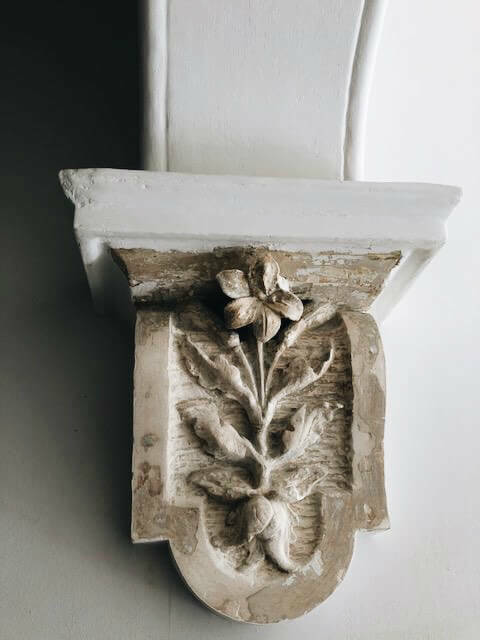 This way we could design little details that would carry throughout the property. Our aim was that when you looked at the completed project, you would get a feeling like this house always looked like this, which we are very happy to say we have achieved! We added a lot of new architectural elements in the space, we based them on the existing details of the house to make sure they blend in. One major addition was the portico that leads to the dining room. We widened this opening as much as we could and lifted it up to create the feel of a space more open. The whimsical 3D reliefs on the portico are of vines and leaves, another motif that connects the kitchen with the garden outside. The kitchen is painted in Farrow and Ball White Tie and for the splash back around the cooker we chose very simple Fired Earth glazed metro tiles for their authentic look. As big project as this one, I am sure the budget was an important part of the work process. Which was of bigger importance for you, the quality, the aesthetics, the quantity? And how did you approach the value for money process? 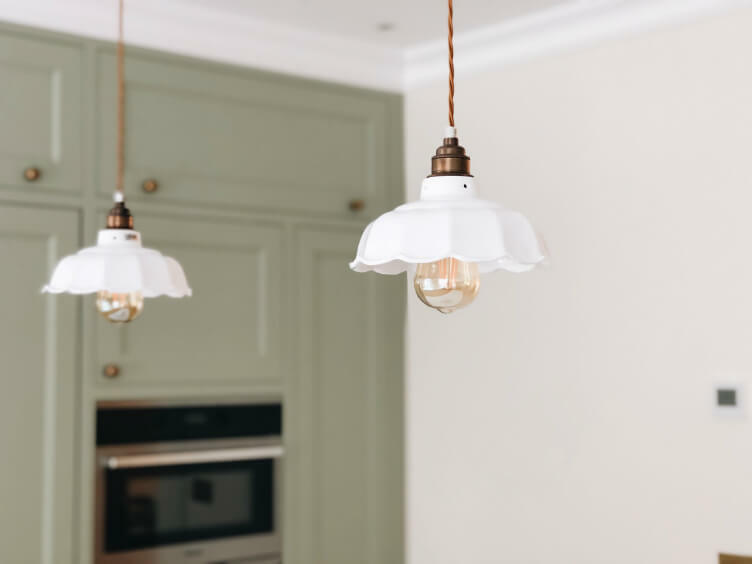 The appliances were very much a practical and budget conscious decision, as the family uses these every day, so we wanted to advise them to go for quality that will last but won’t break the bank. Quartz worktops were chosen for their practicality as well. 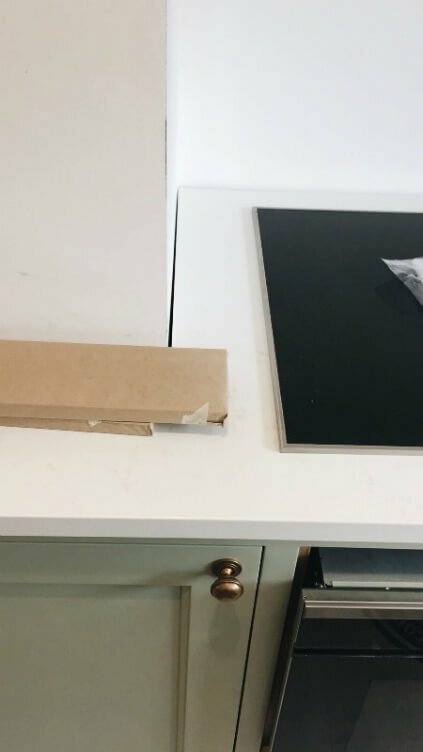 We went to see several worktop brands in person with the client and opted for Silestone Ariel which is a top supplier of quartz surfaces, however this is one of their entry level ranges, so we didn’t have to overspend. All through the process we looked into options of different price point for each item and only paid out more when there was a real difference in quality. 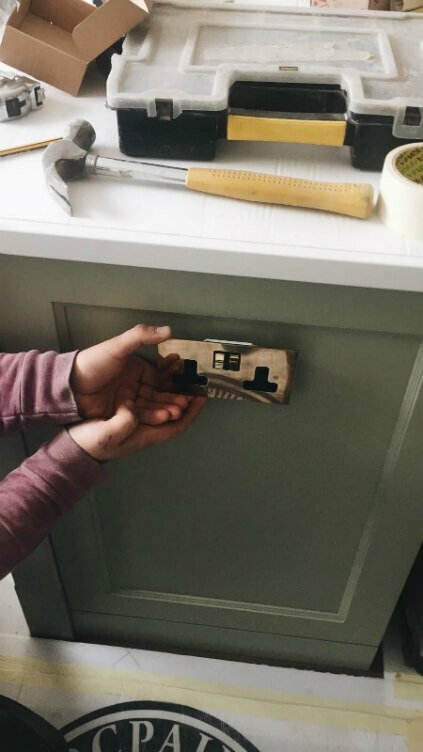 We ordered many pieces online for the house, from companies without showrooms, being fully prepared that there is a chance they won’t look great in real life and we will need to return them, which indeed has happened. We think you have to take some risks and be creative to stretch the budget further, but it’s really worth it in the end. Even if of our clients make a lot of money, that doesn’t mean they want to spend it without consideration, so we respect this in our work.